In my words, my thoughts…my way. 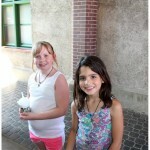 Let’s face it Mom’s of eight years and older girls — they’re growing up and there’s not a lot we can do to change it. As much as we’d like to keep them young forever, there is this little thing called reality that stares us in the face and reminds us that we simply can’t. My daughter turned ten years old recently and she’s already started asking questions. While we have an open communication type of relationship (one I’m very grateful for) it doesn’t make it any easier for her to come to me with things. So, I wanted to provide something that would offer her a place to go to look for answers…when she wanted to and at her pace. After hours of searching and reading reviews I discovered this series of books from American Girl (links to purchase them on Amazon are provided by clicking on the title(s)). Before I continue I want to mention that no one has asked me to complete these reviews. I know bloggers are approached for reviews on the regular, but this one is 100% unsolicited. 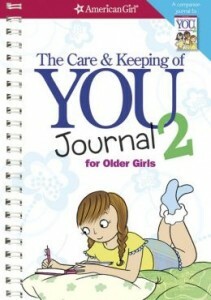 The first set is The Care & Keeping of YOU (Book 1) and The Care and Keeping of YOU (Book 2). Book 1 is for girls 8-10 and Book 2 is for older girls. 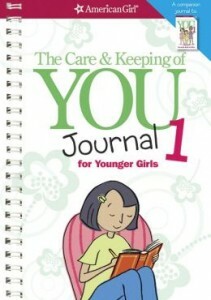 The wonderful thing about these particular books is they also have Journals (Journal 1 | Journal 2) that you can purchase that offers girls a place to write down their experiences and answer questions, track periods and so much more. So if they’re not comfortable talking about it with you, but showing you what they’ve written down in those journals will most certainly offer a way for them to communicate it with you in a less than embarrassing manner. 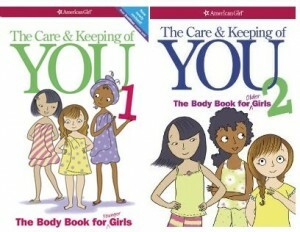 Book 1: Our best-selling body book for girls just got even better! With all-new illustrations and updated content for girls ages 8 and up, it features tips, how-tos, and facts from the experts. You’ll find answers to questions about your changing body, from hair care to healthy eating, bad breath to bras, periods to pimples, and everything in between. Once you feel comfortable with what’s happening, you’ll be ready to move on to the The Care & Keeping of You 2! 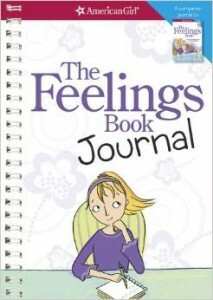 The next book is The Feelings Book. 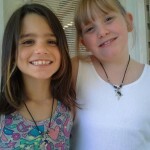 Around the pre-teen years we females begin getting all caught up in our emotions. Sometimes those emotions are difficult to figure out and at times are often confusing. This book offers girls an understanding that they’re not alone in those emotions and a means to dealing with them. It also has a journal. This invaluable companion to The Care & Keeping of You received its own fresh update! 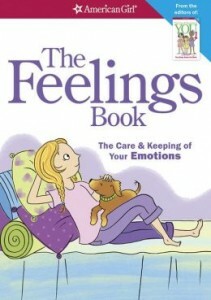 The Feelings Book will help you understand your emotions, and deal with them in positive ways. You’ll get tips on how to express your feelings and stay in control, plus get sensitive advice on handling fear, anxiety, jealousy, and grief. Learn how to stay in the driver’s seat of your own emotions! 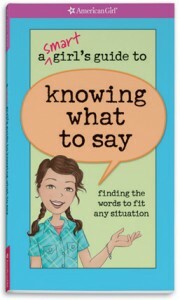 My personal favorite is A Smart Girl’s Guide to Knowing What to Say as I’m big on communication. Remember the phrase, “It’s not what you say, but how you say it“? This book helps them learn how and most importantly…what. A friend talks about you behind your back. What do you say to her? You want to watch a TV show that’s on past your bedtime. How do you ask your parents? You break your friend’s favorite CD. How do you apologize? In American Girl’s latest Smart Girl’s Guide, you’ll learn the exact words to say in these situations, plus more than 200 others!. Tell a friend that you’re sorry for her loss. Ask a teacher for more help. Stand up to a bully. Let someone how much they mean to you. Inside this book, you’ll find the tools, tips, techniques, (and actual words!) to help you untangle your tongue and speak out with confidence and grace. 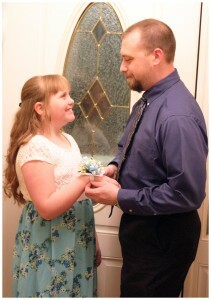 A couple of years ago the PTO at my daughter’s school hosted a Father Daughter Dance (although I call it the Daddy Daughter Dance as I know the difference). 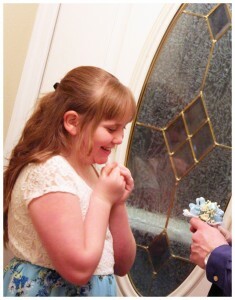 Alexis was so excited to go and acting so giddy that it was absolutely adorable. 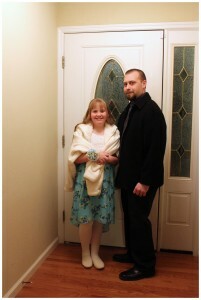 The next school year the PTO disbanded and the Father Daughter Dance was cancelled – she was devastated. My husband isn’t her biological father, but he adopted her in August of 2014. However, she’s been calling him Dad since 2011. 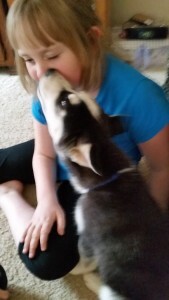 She adores him and anyone who meets them can see it written all over her face (and his). I think the funniest (and cutest) thing about them is even though they aren’t biologically related, people who don’t know the backstory think we’re joking; she looks and acts just like my husband. So when someone, who doesn’t know the backstory gets it all explained to them (if asked), they think we’re making it up lol My husband & daughter LOVE it though <3 It’s something that seems to bond them even more. Back to the story, when we found out that the PTO was back together and planning on the dance again this year her heart all, but skipped a beat. It meant even more to her now that he adopted her…it would be more ‘official’ for her. 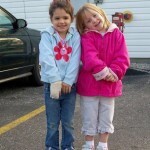 When my daughter was one we lived in an apartment complex where she met her best friend Kiley for the first time. 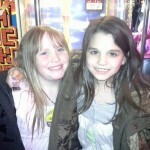 They are only a few months apart in age with Kiley being the oldest. Even though time, a little distance (both families have moved) and busy lives don’t allow them as much time together as they’d like they still manage to let their friendship flourish. 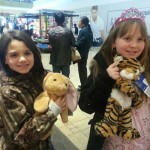 They impress me with how mature their friendship is and they’re only 10 years old. 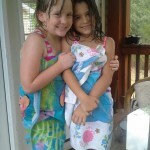 I’ll do everything in my power to assist their friendship into flourishing so when Kiley found out that we were going on vacation for two weeks this summer she said, “I want to go” At first I laughed it off and said, “Your Mom is never going to let you go for two weeks straight” and she said, “Well she’s going to Florida for two weeks. Fair is fair!” and it was left at that. However, as soon as she left the room my husband said, “You know, that’s not a bad idea if Jenn & Nick would be okay with it...” I just sat there and thought, “First, did my husband just say that? He’s already out-numbered 2-1 and… second, he makes a really good point” Kiley brings a certain calmness to Alexis. I think it has something to do with the fact that she’s an only child and Kiley is just the right amount of “older sister” to her. 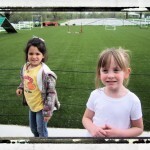 They are both well-behaved, but Kiley has a certain older sister mentality that really brings out the best in Alexis. So, needless to say, when she’s around — we really enjoy her company. So, after giving it all of 5 minutes thought I decided to bring it up with Jenn. She and Nick agreed to letting her go with us. 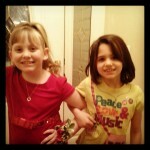 Now it was time to tell the girls! I can honestly sit here and say that I can hardly wait for our 2015 vacation. I’m thrilled that Kiley is going with us, but more importantly…I’m so anxious to help the two of them make even more wonderful memories together. We picked up Stryker on Sunday, February 15th so he’s had 3 official sleeps in our home. The first night was the most difficult between him being nervous in his new place and us adjusting to his schedule. If you’ve never heard a Husky howl, you’ve been missing out! He’s only had a few accidents in the house and seems to be picking up on housebreaking rather easily…almost too easily! In fact, he’s gone as far as grabbing his leash and taking it to the door (per my husband). He had his first official vet visit where he received his first series of puppy shots. He weighed in a 18lbs at 10 weeks. My mind was blown; he’s a big boy for his age. 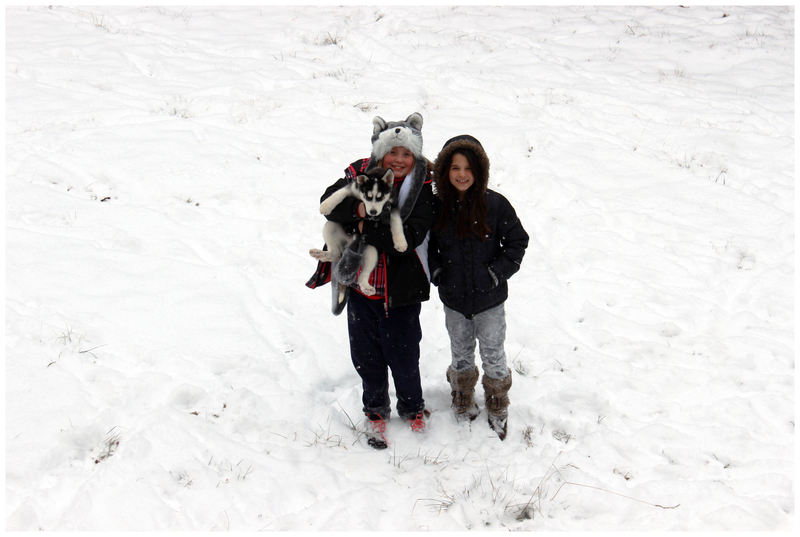 His sister, same age, weighed in at 15 1/2 weeks. Vet said he is perfectly healthy, not that we had any doubt. I’ve noticed that he has really taking a liking to Cadence, and vice versa, which is something we always worry about with her. With her breed (Great Pyrenees) females don’t tend to get along with other females and when bringing an older male dog around her…she justs had nothing to do with him. In fact, she completely avoided him. They’ve actually played together which is such a site to see. All in all, with only having him three days, he’s actually been well behaved (for a puppy). We’re all very happy with him and look forward to spending the rest of our lives with him. 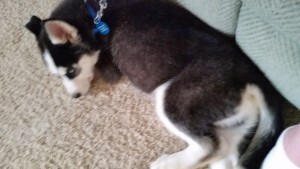 I’ll be keeping everyone posted on his status as time goes on, but for now…I’m off to feed the overly energetic pup some dinner and wear him out for bedtime. My Grandpa has always been the closest thing I’ve ever had to a Dad. He was there for me, I spent just about every weekend with him growing up, we would take countless weekend trips to the country to see his mom & the rest of our extended family, spent those hours driving talking about our family history (this is where my love of studying my family history came into play) and whenever I felt like I needed him…he was there. He’s what I call ‘one of my constants’. He preached. He was a Baptist Preacher – very strong in his faith. He counseled so many over the years and I remember always being amazed by how many people looked to him for guidance. While he hasn’t preached in years, he still remains a man of God. He’ll even tell you that he’s not a perfect Christian (something else I adore about him – his humility), but he always tries to make things right. Five days later I was released from ICU. Eight days later I was finally released from the hospital. My team of doctors called it a miracle. I called it faith. While this post isn’t about religion (I respect those who choose to have a different religion and even those who don’t have any at all – that’s between them and God; it has nothing to do with me), it does play a vital role in how everything turned out. My daughter and I went to visit him on Saturday and got to spend an hour speaking to him. I had told him how I had asked for prayers and positive thoughts from many people. He thought that was great and even made a quick audio recording expressing his gratitude to them. It struck me hard and forced me to find my faith once again. It’s not that I had lost it, but it was a difficult request. What if God’s will was to take him? That was entirely too scary for me to face, but I did. I did it for my Grandpa. I got off the phone and I prayed. It was a difficult prayer, but I kept it honest. Monday came around and his quintuple bypass had begun. I decided to stay at home for as long as I could. I wanted my daughter home from school just in case anything were to go wrong, but I didn’t want to have to keep her at the hospital all day at her age either. I had received a text from my aunt Debbie saying that they were almost finished with surgery, that they only needed to perform four (quadruple) bypass, instead of five, and things were going great. I was getting cautiously optimistic, but my relief was yet to come. I was still scared and needed reassurance. Upon our arrival they had just been called back up to his room. I quickly followed and when I walked in I saw my Grandpa laying there with all kinds of wires monitoring him and on a ventilator. The nurses in charge of him explained what was going on, what was hooked up to him, what they had anticipated to happen and what they hoped wouldn’t. 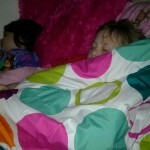 As they spoke, I didn’t hear every word…I could barely take my eyes off of him laying there. It was much too real. They said he could hear us, but would be groggy and probably wouldn’t remember. I remember that from my own surgery – you’re pretty much clueless as to what is going on around you and literally just want to sleep. Yet, there he laid…completely flat in the hospital bed with all those wires and unable to breathe on his own yet. It struck me pretty hard, but knowing he could hear us I didn’t want him to hear me cry so I kept them silent. “Be strong. He’s going to be okay…” I silently repeated to myself. 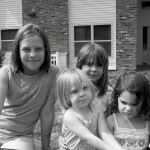 My grandma, mom, aunts, step dad, husband and daughter were all there… I had to be strong. They were upset as well. 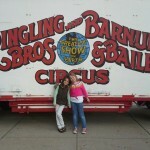 My daughter kept asking, “Are you okay, Mommy?” She was worried as I had tears in my eyes. She knows how much I love him. I assured her that I was and just kept watching him. I thought seeing him would make it better, but it seemed to push my anxiety up a notch more than even I had anticipated. I needed something more…something to show me that it was okay to exhale. They asked that we leave and let him rest. I was feeling very unsure…uneasy. I decided to take a step near his bed to tell him that I love him and that I would be back. The nurse must have picked up on my worry as he asked, “Would you like to hold his hand? You can…he might even squeeze it for you” I shook my head in agreement. I felt like a small child stepping up to him. I flashbacked to when I was around 16 years old and he had a heart attack. By the time I was allowed to visit him (after everyone else) he had fallen asleep. I walked in his room and he was lying in the bed, hooked up to wires and oxygen and I didn’t want to wake him. I whispered, “I love you, Pop! I’ll see you soon” and walked out. I felt defeated and that day I walked away unsure…uneasy. I didn’t want to feel that way again. 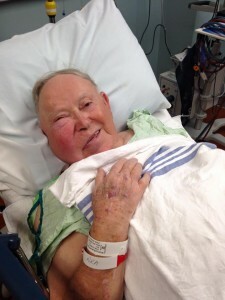 The nurse uncovered his hand (it was under a blanket) and I put my hand in my Grandpa’s and he repeatedly squeezed it. That’s when that cry slipped out…that cry of intense relief. There he was. He was OKAY and he was letting me know. 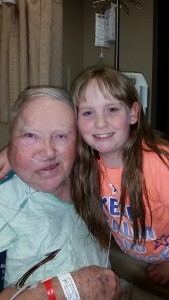 I said, “Grandpa, you said you wanted God’s will…THIS is his will! You’re okay!“ and began to cry happy tears again. My husband said he could see the worry leave my body. I haven’t felt that much relief in my entire life until…he shook his head in agreement. It was the 2nd time he had done that in a few minutes time. He did it once for my aunt as well. I could almost feel my own heart bouncing around inside, the breath that I had been holding in escaping my lungs and a weight being lifted from my shoulders. It was what I needed. Faith won. God’s will was done. I believe in God. I don’t go around thumping on Bibles, but I will attest to the fact that I’m not ashamed of my faith. To which I just want to say….thank you, God. I know I can’t keep my Grandpa forever, but I’ll take whatever you are willing to give and I’ll never, ever take that for granted. Recent reviews by Jennifer J.